During an emergency press conference called by DOLE Secretary Silvestre Bello III, he said that deployment to Qatar are temporarily suspended effective immediately until further notice while they are assessing the current situation. According to report, there are over 140,000 to 250,000 overseas Filipino's that are based in Qatar currently affected by the fall-out between other Gulf countries. “I temporarily suspend the deployment of our OFWs in the county of Qatar. This is for us to be able to assess the situation because there are so many wild rumors going around, saying things are not going well there. This suspension is for the welfare and protection of our OFWs." “We need to study first the situation. For now, the protection of our migrant workers comes first. The duration of suspension of deployment will depend on the assessment of the situation with close coordination with the Department of Foreign Affairs." 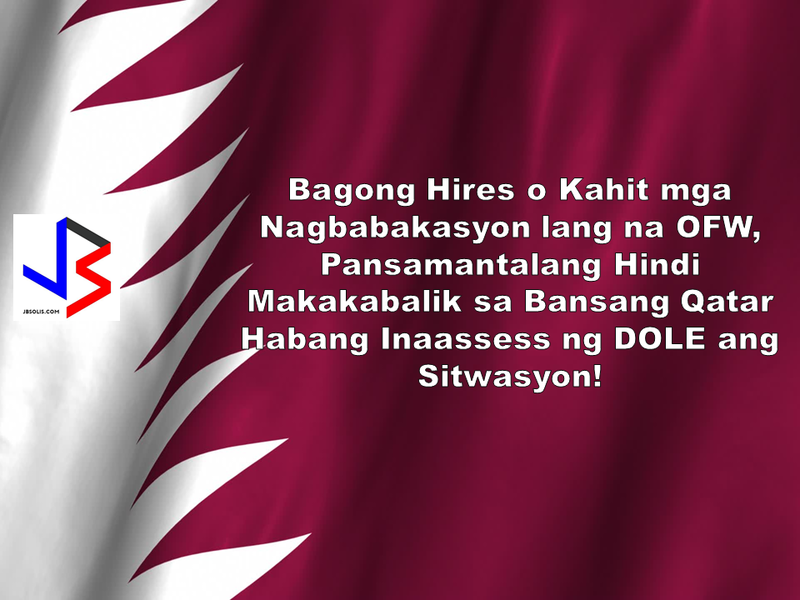 “Our labor office in Qatar is ready to extend any form of assistance under the circumstances. Naka-alert na po ang ating mga tao diyan. Although wala pa naman masyadong cause for alarm, mabuti na ‘yung nakahanda tayo. Our POLO is open on 24-hour service for any emergency situation." “I was invited by the Minister of Labor of Qatar this September for the secured and more lenient processing of deployment of our migrant workers. They said they prefer more Filipino workers. And we maintain good labor relations for the welfare and security of our OFWs." Secretary Bello also directed Labor Attaché David Des Dicang to ensure food provision of the OFWs as Qatar does not have its own food production. He also advised all recruitment agencies to get in touch with their counterparts in Qatar to see to it that Filipino migrant workers are sufficiently and effectively protected. He also said that OFWs should not worry as Philippines still maintains good diplomatic relations with Qatar. The Philippine Embassy in Doha, Qatar issued an advisory, and called on all Filipinos in Qatar to “remain calm and exercise prudence”. Ambassador Alan Timbayan assured Filipinos in Qatar that the Philippine government is closely monitoring the current situation. Timbayan also advised Filipino travelers, especially those with bookings affected by the closing of airspace of Saudi Arabia, UAE and Bahrain to Qatar Airways to consult their travel agents to ensure unhampered travel arrangements.